We have been working so hard to grow this monster tomato plant and slowly over the past two days we noticed that the top of the bush was shrinking! When we look closer....we found tons of giant tomato eating caterpillars!! 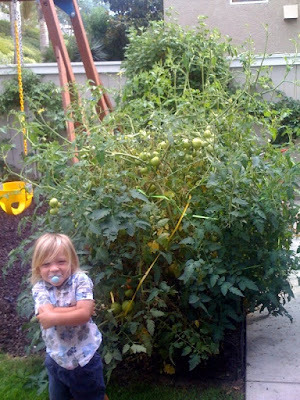 Tyler was so looking forward to making our traditional family pasta sauce with our new tomatoes. He got really upset when he saw some of his favorite creatures taking little bites out of his fruit! To make the best out of the situation we all got to work on picking all the caterpillars off the bush. 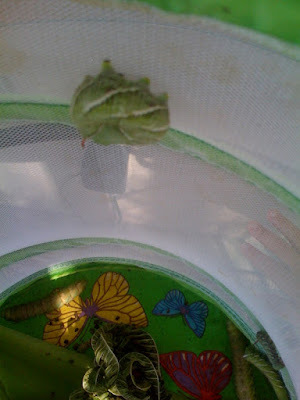 We put them into our caterpillar cage where we hatched butterflies from last year. 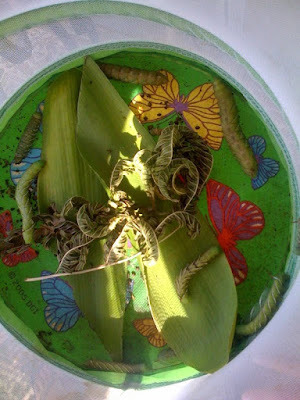 We picked over 40 caterpillars off the bush!! We are going to feed them fresh leaves and hopefully get to see them evolve into butterflies!! 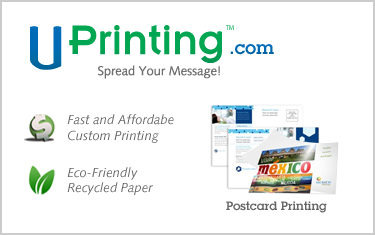 ENTER TO WIN 200 CUSTOM POSTCARDS FROM UPRINTING.COM!! We just love uprinting! They do the most highest quality printing at the most reasonable price! As the holiday's approach we are all going to be looking for a reasonable company to make our families holiday cards. Uprinting.com makes wonderful high quality greeting cards! Uprinting has so kindly offered to give to 2 of our readers a set of 200 custom postcards!! Please post in the comments below, what you would do with the custom postcards! Giveaway will end September 4, 2009 at 11:59pm PST!! Shipping must be paid by Winner. Offer Valid for UNITED STATES SHIPPING ONLY. THE KISSING HAND FELT STORY & GIVEAWAY!! 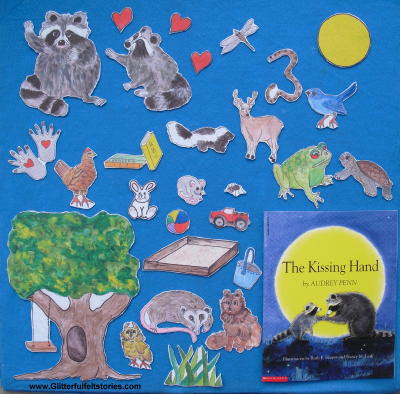 We are so happy to introduce our newest felt story....The Kissing Hand! This is a favorite for all Mother's to read to their children the night before the first day of school. I love to read it to me children every year! Our felt story is made using the highest quality of felt that is made from recycled cans and bottles. The images are printed directly onto the felt creating pieces that will last a lifetime! In honor of the first day of school approaching we are giving away one Kissing Hand felt story and matching book to one of our lucky readers! Tell us what your favorite thing to do to help get your child ready for school! This giveaway will be open until August 29, 2009 at 11:59PM PST. The winner will be chosen via Random.org and will be notified via email within one week of the contest closing. The contest is open to anyone worldwide! Please post a comment for every extra entry! Good Luck!